The mighty castle of Bourscheid might not be as well known as it’s neighbour, the Vianden Castle, but it’s most certainly just as impressive and well worth the visit. Bourscheid castle is perched high above the town that goes by the same name. It’s about a 45 minute drive from Luxembourg City and perfect location for a day trip. While you should definitely drive up to the castle and visit the interior, there are many nice viewpoints around the valley from where you can see the castle in the distance. As the seasons change, the valley changes from lush green to warm orange and yellow tones. And sometimes snow and frost create a magical winter wonderland around the castle. Over the years, I have been lucky enough to see the castle in some extraordinary light. 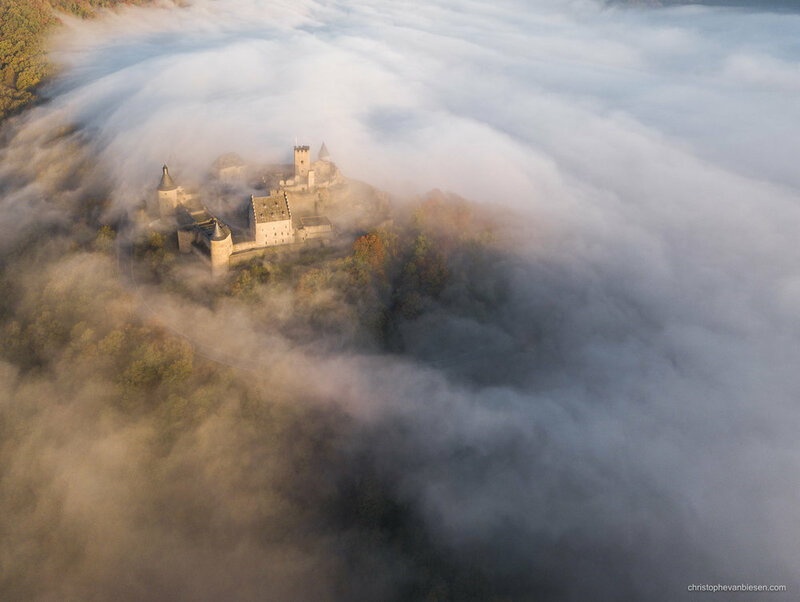 Most recently I witnessed the castle amidst a sea of fog. The castle was playing hide and seek as the fog swept through the valley of the Sûre. Once the sun was high enough, the fog settled down and created a magical atmosphere around the castle. This created a perfect opportunity to capture this wonderful autumn landscape. I started by taking several shots with a long lens to zoom in on the castle and I also shot several panoramic pictures to capture as much of the landscape as I could. The combination of fog, sun and low winds were also the perfect opportunity to take off with my small drone and capture the scene from the air, resulting in some very dynamic looking images. It’s almost as if you could see the fog move and crash against the castle walls like waves. While Bourscheid Castle may look extraordinary in the light of the rising sun, at night the castle offers a completely different atmosphere. In the darkness, this mighty fortress looks gloomy and somewhat eery as if it was straight out of Bram Stoker’s Dracula. Why travel to Transylvania when you can experience a fright in northern Luxembourg? The few lights provide just enough illumination to make the castle stand out. With the fog, they flicker, and you can imagine them being candles or small camp fires, and just for a second or two you are transported back into medieval times.